If you want to get ahead, go outside! It’s a given that writers lead lives of constant and thrilling adventure. The walk downstairs to the kettle is fraught with stomach-churning anticipation; the trip to the spare room to make sure the paint is drying nicely is never less than mind-spinning. And yet, there are times when we must take a break from all this hedonism and re-charge our batteries. And by that, I mean that now and again, we need to get a life. I did just that last week, in Saudi Arabia of all places. I’m working on a book with a prominent Saudi woman on female empowerment, marriage, divorce, enlightenment and loads more. Heady stuff, particularly in the Middle East where such issues are discussed, but not as often as they ought to be. 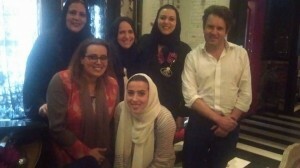 My client invited me to Saudi to see for myself the issues she wants discussing. I have to admit, I was a bit less than enthusiastic. Well, we’ve all heard the stories, haven’t we? And we all believe them, don’t we, because we believe what we want to believe and filter out the rest. Anyway, I went somewhat faint-heartedly, expecting a severe, austere place where access to local people would be limited, at the very most, and where standards of behaviour would put the era of the Spanish Inquisition to shame. Wrong! Wrong! Wrong! On the contrary, I met some of the friendliest, funniest and most generous people I’ve come across for a long, long time. And open too; much more than I expected. In all, I had a great and inspiring week, coming away with a raft of very useful information and insights that I couldn’t have picked up in any other way than first-person. As writers, we spend far too much time in our heads and not enough exploring the people, places and situations that may be the very source of our inspiration, should we choose to look. And we don’t always need to travel across continents to do it. An overheard conversation in the local shop, a glance across a crowded street, the movement of trees in a spring breeze; getting outdoors, and out of your head (so to speak….) can open up experiential and creative possibilities that you’ll never discover second-hand, or on YouTube. Or on this website – so get out and get thinking!